Celebrate Earth Day and be inspired to make a difference throughout the year. 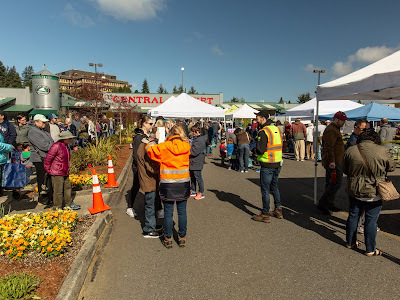 On Saturday, April 27, 2019 from 9:00am – 2:00pm, Central Market and the City of Shoreline invite you to celebrate our Northwest environment. Come try out new eco-living tools and learn how you can help create an environmentally sustainable community. There will be activities for all ages and giveaways designed to help you go green. If you are interested in greening your home, yard, or lifestyle, this event is for you! Talk with experts about low-cost and low-impact landscaping, rain gardens, solar power and green home remodeling, veggie gardening, recycling, composting, wildlife habitat and more! Check out products made from recycled materials, receive starter veggie plants, and enjoy the view from the driver's seat of a Recology truck! Sustainable Living Package: Includes a stasher reusable silicone snack bag, To-Go Ware bamboo utensil set, and a reusable cotton produce bag to help you ditch single-use plastics and go Zero-Waste. Natural Yard Care Package: Includes a 10-lb bag of Walt's Organic Fertilizer Co. worm castings and a 2-oz jar of MicraCulture Plant Probiotics to help cultivate a healthier lawn and garden without harsh chemicals! Puget Hound Pet Care Package: Includes a hard-shell bag dispenser, a clip-on leash flashlight, an alcott bag carrier tool, and bag refill rolls to help you care for your pet and protect water quality in Puget Sound! Shoreline residents can pre-register to access the express line for the giveaways at the event. Register online. This year's sustainability experts include, Brown Bear Car Wash, Diggin' Shoreline, Imperfect Produce, Irons Brothers Construction, King County Noxious Weed Program, Master Gardeners, North City Water District, Northwest Electric and Solar, Recology CleanScapes, Restoration Analytics and Design, Sage Conservation Seattle Audubon Society, Shoreline Farmers Market, Shoreline Solar Project, and Thornton Creek Alliance.